Notes: The Powder Blue Tang is a good example of just how beautiful a tang can be. The color of this fish is a bright light blue with a yellow dorsal fin and caudal peduncle. The face is darker and outlined in white. It is important that you feed tangs a good variety of live, frozen, and prepared formula foods with emphasis in vegetable and spirulina. Best to feed small amounts several times a day. Received the marine life in a very healthy state. 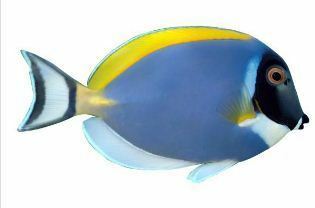 Q: What is size of powder blue tang?